The National Hockey League recently debuted an online feature, "The Stripes: Referee All Access," which follows professional hockey's officials throughout the course of a game during this lockout-shortened season. With the tagline, "as a ref, there are no shifts, no time outs, no plus/minus" The Stripes takes off, greeting as they arrive at Toronto's Air Canada Centre, home to the Maple Leafs and the NBA's Toronto Raptors. NFL referees Tim Peel and Brian Pochmara are highlighted throughout the segment as they speak of the officiating atmosphere at North American hockey's highest level. Also present are linesmen Brad Kovachik and Derek Nansen along with a trip to Toronto's video "war room" during which a goal call is upheld. NHL VP and Sr Dir of Officiating Terry Gregson appears in the dressing room for the officials' post-game. The Stripes and the similar title Behind the Stripes have been used before in connection with officiating-related profiles, including the "Behind the Stripes: A Ref's Life" feature, a 23-minute segment still available online. 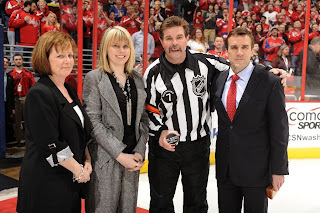 That documentary followed AHL referee Ghislain Hebert as he negotiated the minor-to-major league officiating pipeline, hoping for an eventual full-time NHL schedule and appointment to the staff. Also profiled was veteran Bill McCreary, who spoke of his own journey through the sport. Toronto and the Philadelphia Flyers were featured during that segment; referee Dean Morton and linesmen Scott Driscoll and Steve Barton also made an appearance as members of McCreary's on-ice crew in Philadelphia. Linesman Mark Pare and referee Greg Kimmerly join McCreary and Driscoll for Game #2 in Detroit for a Blackhawks-Red Wing fray. Hebert's second game is a major league call-up affair, an NHL contest with referee Kevin Pollock and linesmen Mark Shewchyk and Kovachik at Buffalo's HSBC Arena where NHL Officiating Manager and former referee Don Koharski drops by for a pre-game, likening his pre-game speech to that of a hockey coach to his team. Both Games #2 ended in shootouts, including an 11-rounder during which the Colorado Avalanche beat the Sabres. After working one last Stanley Cup Finals, McCreary retired after nearly 30 years on the ice. Hebert since was hired to the full-time NHL staff. As a profile of professional hockey officials, yes, the videos prominently feature several fight situations.